The God of War: Ghost of Sparta. (2010, December). Playstation: The Official Magazine, 40-53. 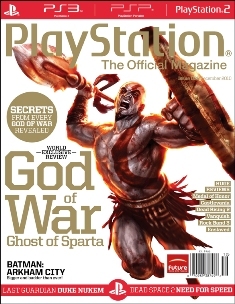 Playstation (PS) and video games fans, of all ages, will enjoy reading this magazine since it not only provides reviews on Playstation 3 (PS3), PlayStation Portable (PSP), and PlayStation 2 (PS2) games, but the pages are filled with stunning gaming scenes, advertisements, posters, and review articles that will keep fans reading to the end. PS magazine consists of “The Big 10” stories, video game previews, featured articles, reviews, and news from the various departments that include a calendars, directories, the “Editor’s Note,” Blu-Ray releases, and a section on Qore (PS’s monthly video gaming programs that allow subscribers to access developer interviews, previews, game demos, and download-able game content). Fans new to PlayStation can easily pick up on all the terminology since it revolves around the games and the systems they are already familiar’ moreover, the magazine provides gamers additional opportunities to subscribe to the PlayStation Network (PSN) where users can download all kinds of goodies (i.e., games, add-ons, etc.). ‘Tweens who are avid PS3, PSP, or PS2 fans will enjoy the in-depth review articles that contain not only specification information, but explain the quirks and the glitches of each game, which determine if the game is worth buying and playing. Video games are rated with system that is quite entertaining; the system includes a scale of 1-10 where a game that ears a 1 is given a “Raw Sewage” rating and a 10 receives an “Awesome” rating. Moreover, the reviews get down to the knitty gritty of each game to provide a well-balanced review that incorporates every aspect of the game including graphics, storyline, time it takes to beat the game, controller issues (i.e., does the character require a million different button combination to jump or fly), and the obstacles that await players. Boys Life is aimed for boys who are interested in Boy Scouts or the outdoors. There are great resources and activities that can help boys earn the next merit badge or inspire others to get involved with helping others and enjoy being active.